A total of 2506 people were taken into police custody in Turkey between 24 March and 11 May 2011. 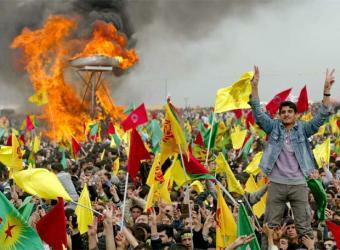 Operations that resulted in the arrest of more than 400 people were carried out between the Newroz celebrations (end of March) and 1 May demonstrations. According to the Dicle News Agency (DİHA), an estimated 2506 people were taken into police custody for political reasons in the course of police operations that started after the Newroz festivals and peaked with the veto decision of the Supreme Election Board (YSK) on 18 April. Hundreds of people were arrested. Only within the past five days, 155 people were taken into custody and 53 people were arrested. According to data compiled by DİHA from the news the agency obtained, more than 2000 people were taken into custody between 24 March and 29 April, a period of six weeks. On 29 April, the last day of this wave of operations, at least 66 people were taken into custody in seven different cities. According to figures announced by the Human Rights Association (İHD), 831 people, 189 of whom were children, were taken into police custody after the veto decision of the YSK between 19 and 29 April. The YSK had decided to bar twelve independent candidates from the general elections, a decision that was partly reversed later on. During the same period of time, two people were killed by the police and 308 people were injured during demonstrations. * At least 177 people were taken into police custody in the scope of operations carried out between 29 April and 5 May. * On Friday 6 May, 163 people were taken into police custody in Kurdish provinces and Hatay/Dörtyol, Bodrum and Adana, 19 of whom were arrested. On 7 May, another 24 arrests and an additional eleven people were registered. * This rate increased further between 7 and 11 May. Throughout five days, 155 people were taken into custody and 53 were arrested. On 9 May, seven university students were arrested, among them one DİHA reporter. On 10 May, 34 people were taken into police custody, three of them are alleged members of the 'Group Comment' organization. * Police operations were conducted in Hakkari, Mardin, Şırnak, Diyarbakır, Siirt, Van, Urfa, Söke, Erzurum and Malatya between 7 and 11 May. Detentions and arrests are different in Turkey. Polce have the right to detain suspects for up to 24 hours, and a judge may extend this time to 48 hours, excluding the time it takes to transport detainees from different facilities. During this time, a detainee is entitled to the right to an attorney. However, under the Anti-Terrorism Law, in cases where a suspect is thought to be linked to a terrorist organization no such right is afforded. In the southeast, this is the case in the vast majority of detentions. In most of these cases, detainees are not allowed to see an attorney until after the detention period is over, allowing police to freely interrogate people without an attorney "getting in the way." According to human rights groups, it is during this time that torture and other forms of ill-treatment is most likely to occur. According to Serkan Akbas, a lawyer with the Diyarbakir Bar Association, most detentions and arrests are based on photographs of people attending this or that event or meeting with people thought to be associated with the KCK or PKK. This has long been the case, though I assume the situation has gotten only worse. A mere photograph and a vendetta can land a person in serious trouble. Detentions also routinely follow demonstrations and clashes with police, such as have been occurring in relation to the "peace tents" the BDP has setup in relation to the "democratic solutions" campaign. Those arrested during protests can face more jail time than actual militants who decide to surrender. Under a limited amnesty law, militants receive a maximum of six year and three months in prison. Meanwhile, protestors can face between seven and 15 years in prison. For more on this, see Human Right Watch's November report on protesting as a criminal offense. Further, arrests, even if based on the shoddiest of evidence, can land one in prison for months. According to the Minister of Justice, the average length of time between arrest and a trial verdict was 580 days. The problem of prolonged periods of arrest is indubitably a violation of the right to an expedient trial guaranteed under the European Convention of Human Rights. In the wake of the Ergenekon and Sledgehammer investigations, yhe practice has been criticized by the Turkish Bar Associations' Union. Bilgi Univeristy law professor Idil Elveris writes about the issue here.